Behold earthlings. The mother of all the giant LED screens is finally here and this time itâs going to be slapped on the face of an entire building. Thatâs right folks, the good people over at UAE development company Tameer have come up with a magnificent plan that will brighten the Dubailand city skyline like never before. 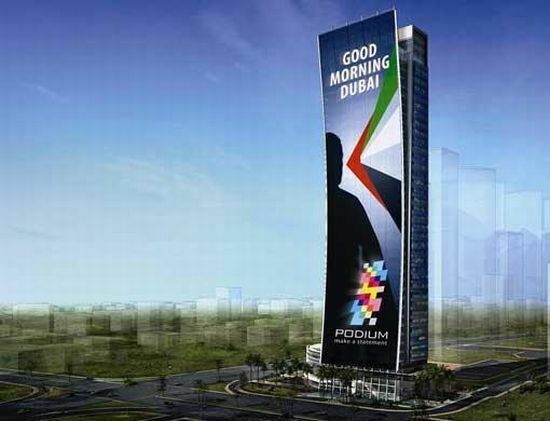 Dubbed âPodiumâ, the worldâs largest LED screen to be embedded on an intended commercial tower will feature a 33-storey high LED media facade that will be visible from a distance of 1.5 kilometers! Now, thatâs some prime advertising space if you ask me! Go Golf this vacation with Ferrari! ← Erasing the habit of smoking with a matchstick!